This customer’s canvas Gucci handbag came into The Handbag Spa looking a little distressed and in need of a pamper. First of all, the technicians undertook our exclusive Gucci Handbag Cleaning treatment. which is perfect for cleaning up the canvas! Furthermore, the team then went about smoothing over the leather corner trim. Afterwards undertaking a Colour Touch Up treatment to freshen up the brown colour of the leather trim. 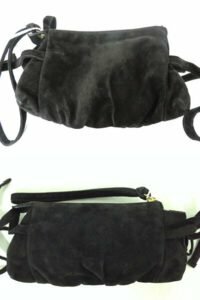 Have a designer nappy bag in need of a specialist clean? 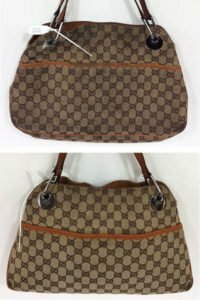 We get lots of Gucci gg diaper bags through our doors in need of some TLC! This black canvas version came into the spa for a Gucci Handbag Cleaning treatment and Recolour to the leather trim. 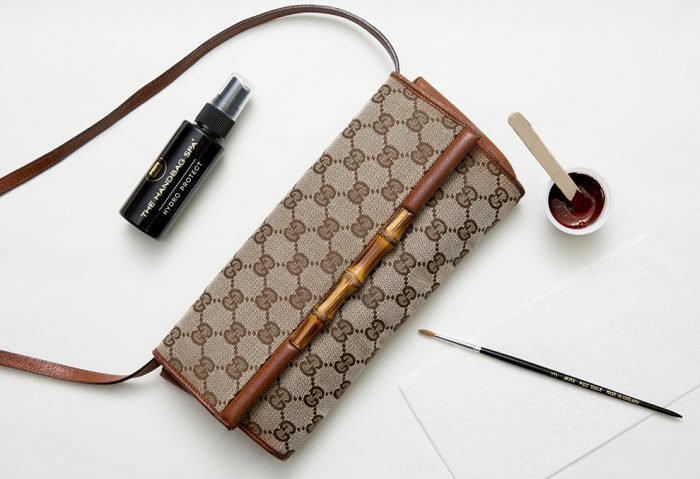 This ensured the Gucci bag was cleaned inside and out, so it left The Handbag Spa looking revived and refreshed. In addition to undertaking a professional clean, we would recommend using our Anti-Bacterial Cleanse for cleaning diaper handbags at home. This product is scientifically proven to kill 99% of bacteria, so you can rest assured your nappy bag is germ free. Nubuck leather can be a notoriously hard to maintain. That coupled with the light taupe colour of this Gucci 1970 handbag meant it was a magnet for dark Dye Transfer marks! Luckily, here at The Handbag Spa, we offer a specialist Nubuck Clean treatment. 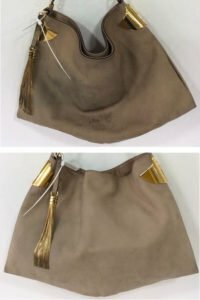 This can reduce dye transfer marks from denim and get handbags back to looking their best. 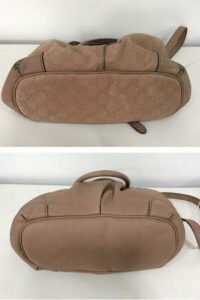 This suede Gucci handbag needed an expert clean when it came into the spa. Consequently, with use its exterior was looking dusty and dirty. 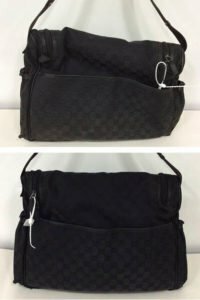 After the technicians carried out a Suede Clean, the designer bag looked much cleaner. With the marks and stains considerably reduced. The Jackie Gucci handbag is an iconic style, as made popular by Jackie O herself! Unfortunately this leather style commonly suffers with colour fade. Luckily we have lots of experience rectifying the colour and bringing Gucci bags back to life! This customer sent her blush pink monogram Gucci bag into The Handbag Spa for some R&R! Bottom of handbags can definitely see some wear and dirt build up with use and this designer bag was no exception. Consequently, we recommended a Full Clean and Full Colour Restoration to freshen up its appearance. The combination of these treatments meant this Gucci handbag looked immaculate when it left the spa and we had a very happy customer as a result. The navy colour of this Jackie Gucci handbag had really faded. 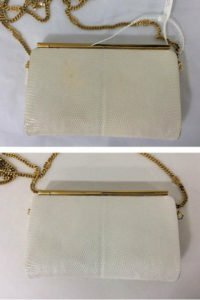 It was definitely in need of our restoration expertise to transform the bag back to its former glory. 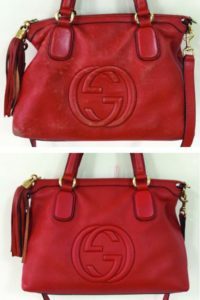 It underwent our Gucci Handbag Cleaning, Corner Repairs and Colour Restoration treatments here at The Handbag Spa. Because of these treatments, the customer was left with a Gucci handbag, looking (almost) as good as new! A bright red bag is definitely one you want to keep looking its best. Although exposure to UV rays combined with the buildup of dirt and grease over time doesn’t make this easy! 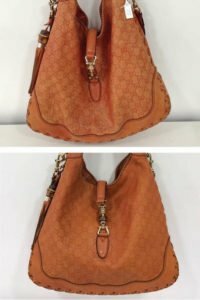 Colour fade is such a common problem for handbags, which this soho Gucci handbag had a bad case of. Due to years of use, the owner of this bag decided to send it to The Handbag Spa for some expert attention. 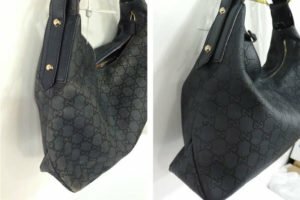 As a result of the Full Clean and Colour Restoration treatments, this Gucci handbag is back in tip-top condition. This small exotic leather Gucci handbag had some yellow staining on its exterior which the owner wanted gone. 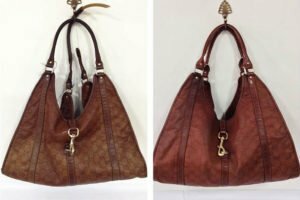 The technicians rectified this with a Full Clean and Colour Refresh, as a result the customer was happy with her finished handbag. 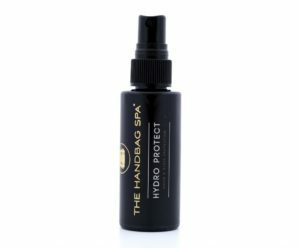 Protect your fabric, canvas, suede and nubuck bags with Hydro Protect, a non-solvent and fragrance free waterproofing spray, allowing you to take your prized handbag out whatever the weather. Apply this product every 2 weeks if you use your bag on a regular basis.